*maximum WIDTH for doors is 24". 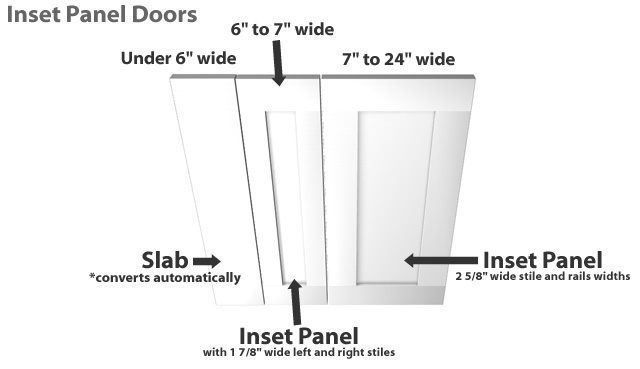 Doors ordered under 6" in width will automatically be converted to a SLAB. All hinges sold on this website will work with these hinge cup holes. Maximum width available for doors is 24"
The cabinet doors are done excellently. I received them as stated. I built my own kitchen cabinets, but any thought I had of building my own doors was quickly dispelled when I opened the package. These doors are perfect, very well-constructed and consistent. The sizes were exactly what I had ordered. They painted up nicely and are going to look great in our kitchen. The Doors Delivered on time and were exactly as advertised - super nice and wonderful quality. Will Buy again for next project!